Sure Conan looks like he needs a doughnut or two, but he's still a guy you don't want to mess with - on the high seas or on land! Dark Horse says: Conan and BÃªlit are the undisputed masters of the Western Ocean, their names whispered in fearful awe all along the Black Coast. But when Conan spots a mysterious, derelict ship following them, its horrifying cargo threatens to destroy everything they've built and tear them apart! 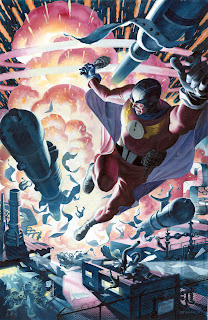 If one guy can do cool retro without carbon-copying the greats it's Steve Rude. That is underlined here. 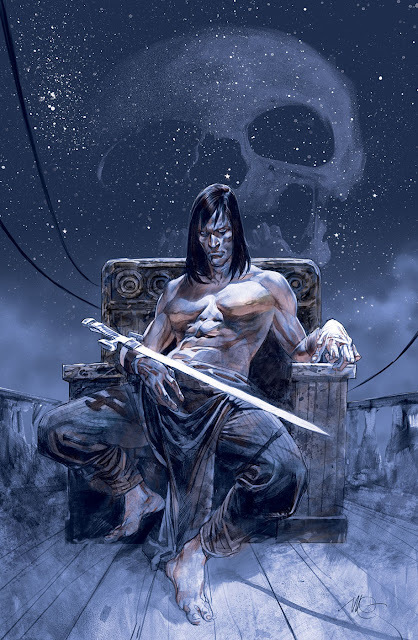 Other Dark Horse November 2012 highlights include; John Ostrander launches a new epic in Star Wars Dawn of The Jedi - The Prisoner Of Bogan #1, Buffy's Willow gets her own title with the aptly named Buffy The Vampire Slayer: Willow Wonderland #1, and honour and violence collide in 47 Ronin #1. What do you think? Sound off below. For November 2012 solicits from other publishers as they're released click here, or for Dark Horse's full November line-up, follow the jump! Now that Steve Rude cover is really nice. I swear I've seen that character before. Who is he? I think I've seen him when I used to go to those micro-hero sites.